We offer statements by Patriarch Kirill of Moscow and All Russia, Metropolitan Hilarion of Volokolamsk, Metropolitan Antony and Bishop Daniel (Ukrainian Orthodox Church of the USA), and Bishop Gregory of Nyssa (American Carpatho-Russian Orthodox Diocese of the USA). Fr. 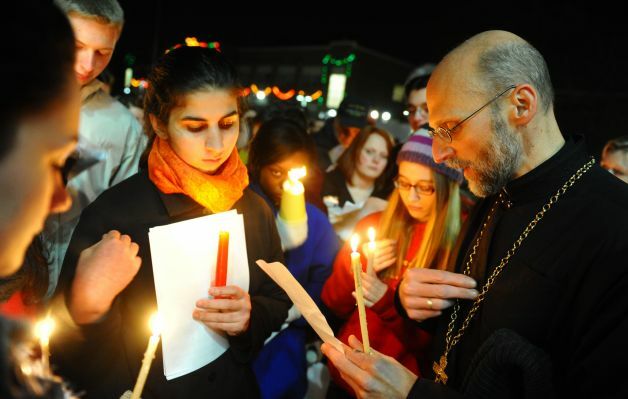 Peter Paproski of St. John’s Orthodox Church in Stratford, CT, prays at a candlelight vigil on December 15. The news of the terrible tragedy at the Sandy Hook Elementary School in Newton, Connecticut, has resonated in my heart with deep pain and grief. Please, accept my sincere and cordial condolences. This evil deed claimed the lives of people, most of whom were small children. The murderer did not spare either defenseless pupils, or his own parents. The Russian Orthodox Church shares the grief of the people of the United States and sorrow of the parents who lost their children, prays for the repose of the souls of the victims and consolation of those mourning, and hopes that such a tragedy does not recur. Please, accept my deepest condolences over the tragedy at Sandy Hook School in Newtown. Many people, most of whom were small children, fell victims to this tragedy. The way the teachers acted inspires respect: thanks to them, dozens of pupils have been saved. With all my heart I sympathize with the parents, relatives and friends of those who died or were injured. I ask you to convey to them words of consolation and support. I offer up my zealous prayers to the All-Merciful Lord for children to live peacefully and without troubles under the protection of parents, society and law in all corners of our planet. We, along with all our clergy and faithful of the Holy Ukrainian Orthodox Church of the USA, express our profound sympathy to the parents and family members of those lost. We embrace you with in the Love of God and assure you of our continued prayers that the Almighty encompass you in His Comfort and Mercy. We direct all our clergy and parishes to pray for the repose of the souls of those lost this day in a Memorial Service – Panakhyda following Divine Liturgy on Sunday, 16 December or on 23 December, and also to pray for their surviving family members, fellow students and teachers during the Litany of Fervent Supplication of the Divine Liturgy on these same days. JOHNSTOWN, PA [Diocesan Chancery] – His Grace, Bishop Gregory of Nyssa, upon learning of the horrific tragedy at the Sandy Hook Elementary School in Newtown, CT, where 26 people, most of whom were children, lost their lives during a mass shooting, has called upon the faithful of the Diocese to offer up fervent prayers for the many families and people affected by this catastrophe and the repose of the souls of the innocent victims. I am shocked and greatly pained at this senseless loss of life. At this special time of the approaching Nativity of our Lord and Savior Jesus Christ, I am reminded of King Herod’s heinous act of murdering the 14,000 infants (the holy innocents) in his attempt to destroy the Christ Child. In Matthew 2:17-18 we read, “Then was fulfilled what was spoken by Jeremiah the prophet saying: A voice was heard in Ramah, lamentation, weeping and great mourning, Rachel weeping for her children, refusing to be comforted, because they are no more.” I strongly encourage all adults to hug their children, grandchildren, and Godchildren and tell them how much they love them today and every day. The Diocesan Chancery has learned that while there are faithful of the diocesan parishes in Connecticut that live and attend schools in Newtown, it appears at this time, by the Mercy of God, that all are safe. May our Merciful Lord God and Saviour Jesus Christ grant comfort, peace and healing to the grieving family and community members, and rest eternal and blessed repose to the souls of the holy innocents and the heroic teachers and staff members and establish them in Paradise where there is neither sickness, sorrow or suffering but Life Everlasting. May Their Memory Be Eternal!